Our weekly therapeutic group Bridges is going well. I’m so pleased with how it’s developing. We’ve had no major incidents or problems, and the feedback about the group has been excellent. (‘We’ are a few people working together in the dissociative initiative, a group developing resources around dissociation.) It’s not the ideal space for everyone, but it’s clearly going some way to meet a need in the very under-resourced area of dissociation.It’s actually a pretty exciting project, there are very very few peer-run dissociative groups out there. We did a lot of talking, reading and research before we launched the group to make sure we came up with a good model. It was about a year in the making between discussing creating a group and actually having our first meeting. Part of that time was also spent developing resources such as basic information about DID and Dissociation, and giving talks about the topic to start raising awareness of the needs in this area. We also gathered feedback directly from people with these conditions to check that our assessment of what people wanted was on target. We ended up drawing a lot from the model used by the Voice Hearing groups, particularly in regards to the open nature of the group – it is held weekly but there is no pressure on people to attend. While a group like this can be a huge support and resource, it can also be unsettling and disruptive, leaving people feeling ‘stirred up’. We wanted people to feel a sense of belonging even if they only chose to come occasionally, and to have the opportunity to self-regulate, that is, to decide for themselves when and how often attending the group was going to be helpful. The feedback we’ve had from people has suggested that this approach is working well, and just knowing that the group is there and available even if someone isn’t attending every week does help to create a sense of being welcome and accepted somewhere. Some of the group models we encountered exerted a high degree of control over participants, for example, requiring signed documents from treating psychiatrists that the person had a dissociative disorder, was in active current therapy, and had the doctors permission to attend the group. Some of the models were also very regimented, with a strict schedule of discussion topics, and required attendance at each meeting. Safety everyone has the right to experience a sense of safety and support within the group. We ask people to be mindful of not distressing each other by discussing sensitive things such as graphic abuse memories. Everyone is encouraged is speak up if something they are not comfortable with is being discussed. The personal sharing within the group must remain confidential. Some people attending have not disclosed to other people in their life about their experiences, it is especially important to not accidentally ‘out’ anyone. The group facilitators are available if anyone needs to debrief or wishes to discuss something further outside of the group. Respect each person, their ideas and perspectives. We don’t need to agree with each other and we try to avoid advising each other as the recovery process is very individual and what works for one person may not be the best approach for another. We do share our thoughts, ideas and experiences so that we can learn from each other, but we don’t try to make other people agree with us. We all have the right to understand our experiences in our own way. Recovery the focus of the group is to share, listen, feel heard, and develop strategies to better manage dissociative experiences. It is okay to be struggling or frustrated, but the goal of the group will always be to grow and develop our own recovery journeys. Acceptance the group will aim to make room for all people who benefit from attending and each person is welcome to be however they need to be at the group, as long as safety and respect is maintained. Group members are at different places on the dissociative spectrum, and have different experiences around dissociation or multiplicity. We will not diagnose one another or in any way encourage a worsening of symptoms. Some people may switch during group, and there is no problem with this. While we especially seek to make people with multiplicity at home, no condition or experience is more important than any other. The format of Bridges is that anyone who experiences dissociation and/or multiplicity is welcome to come along. They can contact us first if they wish, or they can just turn up on a Friday and see how it feels. (Do check MIFSA is open, it will close for a little while over Christmas for example) People don’t need an official diagnosis or even to be certain that dissociation/multiplicity is what they are experiencing. It can be very confusing, and it’s okay to come along while you work out what is going on. People are welcome to bring a support person along with them if they wish, such as a friend, carer or worker. We don’t allow support people to come by themselves unless they also experience dissociation/multiplicity as group members can feel a bit exposed otherwise. We do recommend that people consider bringing a support person or making safe arrangements to get home from group if they anticipate being too stirred up to safely drive or navigate public transport after the group! I do prepare a range of relevant discussion topics in advance, but we aim to uncover them naturally as people share ideas or concerns within the group. Every week I post here some aspect of our conversation that may be useful, partly for the benefit of people who can’t attend, and partly because many people who experience severe dissociation have difficulty retaining information and having a written history of group topics to refer to can be a useful resource. I’m continuing to grow our little library so that people who find bibliotherapy helpful (like me!) can freely access relevant books. We would love any donations if you can help! One of my next major goals is to work on developing a way to include rural or house bound people. Another is to see if we can source some funding to pay us a little for our work. There’s also a tremendous need for specific carer support in this area. I went out this week and bought some new supplies for Bridges. 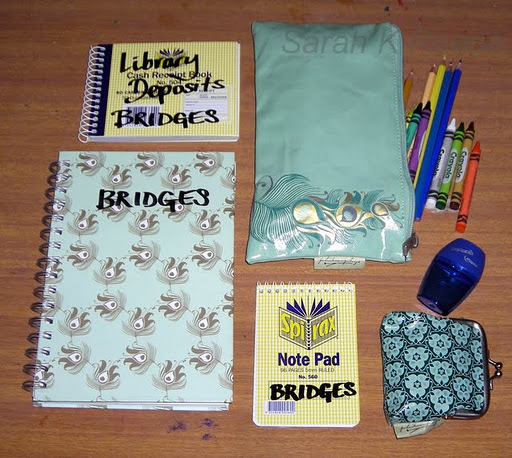 I now have a receipts book and coin purse to handle the deposits for my library books, the Bridges notebook for details such as possible discussion topics, and the pencil case, pencils and crayons are for people to draw or colour during group if they wish. The table is always set with books to browse, water and snacks, and colouring in paper. Doing something with your hands can be a useful distraction to calm down when feeling anxious. Colouring supplies also help make Bridges a safe space for younger alters. I’m very proud of this group, for everyone who comes along it is such a huge achievement considering the atmosphere of controversy and hostility that sadly dominates conversations about dissociation. I’m hoping this group is a small step in the direction of changing things and improving the support offered to people who experience dissociation.